MULTI AWARD WINNING ARTWORK, ARTIST AND COMPANY. At Advanced Airbrush we offer custom paint such as Crystal Ice Pearls & Flakes through to full custom artwork & graphics. 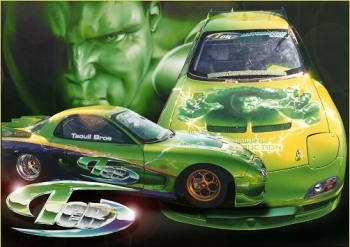 Many of our airbrushed cars have won Top Awards in Custom Painting, Murals and Graphics in Auto Salon, Summernats, Motorex and hundreds of car shows around Australia. Our work is backed up by over 30 years experience in Custom Auto Art & Paint, and our artists Wayne and Ryan are responsible for the high quality work you can view in the sample galleries below. As well as producing the art for Top Show cars, we also enjoy creating the look for the street car that makes you an individual. Or that custom corporate feel to your work truck or van. Wayne also specialises in airbrushing Tribute vehicles for our clients, including the Pink Convertible, Lady Gaga Ute, the “Legends of Rock” Stretch Limo and many more - with some of the depicted artists even personally signing the tribute cars for our clients. Prices start from $1200 for a Bonnet Mural (street) to $2,500 (show). Please Contact Us for a quote.